Convert your PDFs to Word files on your Mac! One simple click will convert any of your PDF files into a modifiable Microsoft Word document! eXpert PDF for Mac allows you to convert your PDF files into Word documents that you can then modify as needed.If your original PDF file is a scanned document or an image, you will be able to scan your document using the OCR feature included in the Professional version of eXpert PDF for Mac. Recover formatted text and images while retaining the original page layout! 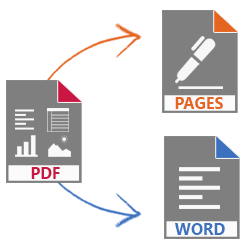 Regardless of the content and layout of your original PDF document, eXpert PDF for Mac guarantees you an optimal conversion of the layout of the original document and the text and image layout. Convert your PDFs into other standard formats! The converted PDF files can be both read and/or modified allowing you to edit your document.